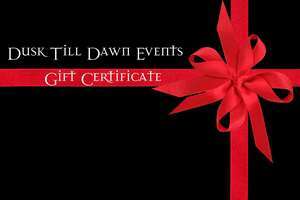 If you’re looking for an unusual and different Christmas, birthday or gift idea this year a Dusk Till Dawn Events Gift certificate makes the perfect present to buy for your Friends and Family. This Gift certificate is valid for a full year from the time of purchase. Please note if this Gift Certificate is not used within the valid from and valid to dates as shown on the purchased Gift Certificate we will be unable to offer any exchanges or extended dates. Gift Certificates are non-refundable and change will not be given if the amount of the Gift Certificate is not fully used and can only be used our website www.dusktilldawnevents.co.uk. All Gift Certificates are sent via email in PDF format for you to print at your leisure, please ensure the email address entered at the time of booking is correct. If you require the gift certificate to be posted via postal service please let us know at the time of purchase. *Please advise at time of purchase if you want us to personalise the gift certificate by adding the recipient’s name for you. Please note if you do not advise us at the time of purchase the gift Certificate will be left blank. *Subject to availability of the event of choice.